Normally the School conducts examinations during May/June and November/ December every year at the major study centers. However, the University may conduct examinations in some other centres in future. Students enrolled in courses which are conducted under annual pattern will have their annual examinations in May / June and their supplementary examinations in November / December. All examinations will normally be held continuously and the duration for each written paper is 3 hours. The students appearing for the examination for the first time should register his/her name for all subjects by remitting the prescribed fee. Supplementary examinations will be conducted separately. The application forms for current examinations indicating payment of fees to be paid will be sent by the Director, School of Distance Education and the forms for supplementary examination will be sent by the Controller of Examinations. Centres and dates of the examinations will be intimated to the students by the Controller of Examinations, as and when the dates are finalized. Candidates shall collect their hall tickets for the examinations from the Chief Superintendents of the centres concerned, on production of their identity card during the three working days prior to the commencement of the examinations. Blind students shall write their examinations through the help or scribes. Such student are instructed to request the concerned Chief Superintendent for the appointment of scribes as per the University rules. 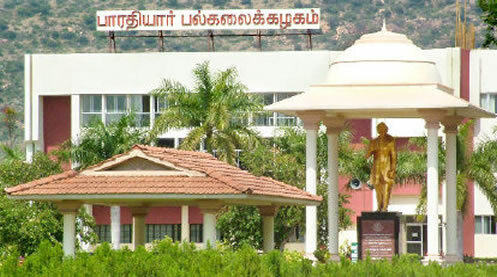 In case, a student seeks retotalling / revaluation he / she can do so by applying for it, to the Controller of Examinations, Bharathiar University along with the prescribed fee. Revaluation is available only for those courses having single valuation. Applications for the above processes must be made within 15 days from the receipt of the statement of marks. Applications for revaluation can be downloaded from the University Website. The present fee for retotalling an answer script is Rs. 200/- and the fee for revaluation is Rs. 300/- Such application should be sent only to the Controller of Examinations, Bharathiar University and NOT to the Director, SDE.